Dr. Janet Boseovski (B.Sc., University of Toronto; M.A., McGill University; Ph.D., Queen’s University) is an Associate Professor in the Psychology Department and Co-Director of the DUCK Lab. Her research examines children’s understanding of their social world, including children’s trait judgments about people (e.g., moral character) and their ability to rely on others appropriately to learn about the world (e.g., differentiating experts from non-experts). New interests include children’s learning in informal settings, adults’ critical thinking about parenting, and young adults’ feelings about becoming parents. Janet’s research has been published in professional academic journals such as Child Development and Developmental Psychology, and her work has been supported by the Eunice Kennedy Shriver National Institute of Child Health and Human Development. She is a Faculty member of the Center for Developmental Science and serves on the Editorial Board for the Journal of Experimental Child Psychology. Janet speaks in the community regularly about issues related to child development and she recently created “Crafts & Conversation”, a community-engaged event for children and families in the Greensboro community. In her spare time, Janet enjoys lifting heavy things (i.e., resistance training), running, Ashtanga yoga, and hiking all over the USA and Canada. She also spends (too much) time listening to science and lifestyle related podcasts and music, and watching inter-species animal interaction videos. Dr. Stuart Marcovitch (B.Sc., McGill University; M.A., Ph.D., University of Toronto) is a Professor and Co-Director of the DUCK Lab, as well as the Head of the Department of Psychology. Broadly, his research focuses on how children learn to control their behavior in challenging circumstances, with an emphasis on the role of reflection. Stuart’s research has been published in professional academic journals such as the Journal of Cognition and Development and Developmental Science, and his work has been supported by the Eunice Kennedy Shriver National Institute of Child Health and Human Development. Currently, he is the Editor-in-Chief of the journal Cognitive Development and completing his term as an Associate Editor of the APA journal Developmental Psychology. In his spare time, he enjoys cheering for ill-fated sports teams, enjoying fine foods, and really enjoying not-so-fine foods. Dr. Courtney Ball (B.A., University of Notre Dame; M.A., Ph.D., University of Rochester) is a postdoctoral fellow in the lab. Courtney's research centers on the affective, cognitive, and social processes associated with the development of moral reasoning and judgments in early and middle childhood. She is specifically interested in the developmental impacts of empathy and social inequalities on early moral understanding about harm and injustice. In her spare time, Courtney enjoys exploring local coffee shops and game stores and snuggling with her two beloved and adorable long-haired chihuahuas, Keegan and Alina. Kathleen Bettencourt (B.S., University of Mary Washington; M.A., UNCG) is a fifth year graduate student in the lab. Kathleen's research interests include the development of episodic and autobigraphical memory and how these are related to other cognitive abilities. In her spare time, Kathleen enjoys going to sporting events, binge-watching NBC comedies, and challenging Jessica in Harry Potter trivia. 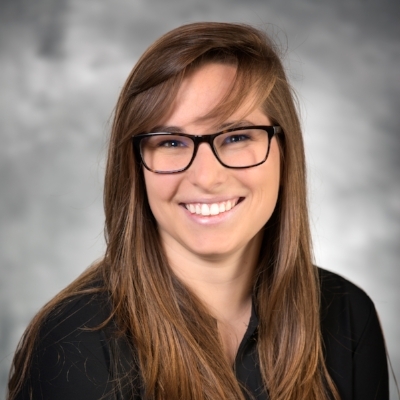 Jessica Caporaso (B.S., High Point University; M.A., UNCG) is a fifth year graduate student and lab co-manager. Jessica’s research interests include the development of cognitive control social competence, moral understanding, and the relations between the three. In her spare time, Jessica enjoys baking, hanging out with the Caporaso house marauder/dog, Luna (Lovegood), and losing to Kathleen in Harry Potter trivia. Rachel Croce (B.A., University of Maryland; M.A., UNCG) is a third year graduate student in the lab. Rachel's research interests include children's socio-cognitive development, specifically in relation to their social decision making. In Rachel's spare time, she enjoys playing board games, going to concerts, and attending sports events. Kimberly Marble (B.A., M.A., UNCG) is a fifth year graduate student and lab co-manager. Kimmy's research interests include children's perceptions of expertise and authority; specifically, children’s use of social group or trait information in their evaluation of people who serve as sources of information (e.g., doctors, teachers). She is also interested in the cognitive skills that support these areas of social reasoning. In her spare time, Kimmy is learning to like running, binge-watches Star Trek, and snuggles with her psych-savvy cat, Gilbert (Gottlieb). Andrea Yuly (B.A., University of Virginia) is a third year graduate student in the lab. Andrea’s primary research interests involve exploring children’s beliefs and predictions about individuals who defy traditional social categories, particularly in the gender domain. She is also interested in investigating how these deviations from group-based expectations influence other areas of children’s social reasoning. In her free time, she can be found re-watching Grey’s Anatomy, listening to the Backstreet Boys, or “managing” her dog’s Instagram. Jordan Anderson is a sophomore psychology major at UNCG and is interested in developmental psychology. She is working in the lab to gain research experience and to figure out what type of psychologist she wants to be. In her free time, Jordan enjoys singing in her a cappella group, hiking, camping, and gaining new experiences. Madelyn Church is a junior psychology major with a minor in sociology at UNCG. She plans to attend graduate school to study social psychology. In her free time, she enjoys hanging out with her friends, binge-watching Netflix, and listening to music. Nicole Fanatico is a junior psychology major at UNCG. After she completes her Bachelor of Science degree, she hopes to pursue graduate education in developmental or clinical psychology to achieve her goal of improving the lives of adults and children alike. Working in the DUCK lab is the start of this adventure for her. When she isn't doing schoolwork, Nicole enjoys knitting, running, and cooking. She likes to sleep well, eat well and be happy. Abby Giles is a junior psychology major at UNCG who is working on an honors project in the lab. She wants to gain work experience with children and hopes to one day become a pediatric occupational therapist. Abby enjoys spending time with family, walking with her dog, and playing volleyball! Kestyn Harris is a senior psychology major at UNCG. She is volunteering in the lab in order to gain more experience working with children, as she is hoping to become a child psychologist. She enjoys musical theater, coffee, and a good book. Emily Herry is a senior psychology major with a minor in sociology at UNCG. She loves research and is looking forward to gaining even more research experience. Her research interests include the effect of relational bonds on development across the lifespan, how children perceive others as different from themselves, and also how children learn and develop socially. In her free time, Emily enjoys sewing, reading, baking, crafting, and spending time with her loved ones. Destiny Langley is a senior psychology major with a minor in political science at UNCG. Destiny is working in the lab to gain research experience as well as experience with children. She plans to go to graduate school to pursue a career as a child and adolescent psychologist. In her free time, Destiny enjoys reading, hanging out with friends, listening to music, and binge-watching Netflix with her dog, Remi. Madison Audrey Owings is a sophomore pursing a Bachelor of Science degree in psychology at UNCG. She is interested in the clinical area of psychology and a potential career as a therapist. Audrey is looking forward to gaining research experience with children, as she is interested in how brain development correlates with emotional awareness and conscious experience. Her hobbies include running on the UNCG track/cross country teams, hiking, camping, reading, and spending time with her three-legged cat. Harrison Prince is a senior psychology major with a minor in interior architecture at UNCG. He is excited to work in the lab and to learn more about the research process. His research interests include how children acquire language. In his free time, Harrison enjoys reading, writing, and attempting to bake. Mya Wilson is a sophomore psychology major at UNCG. She has a passion for working with children and is excited about gaining experience in the lab. She hopes to one day become a child psychologist. When Mya is not busy interacting with her residents as a resident advisor, she loves to read interesting news articles about current world events or listen to educational and health-related podcasts, and look at food blogs that make her hungry. Jessica Barselow is a senior psychology major at Guilford College. She plans to attend graduate school to study child clinical psychology, and looks forward to the opportunity to conduct research with children. Outside of school, she is a director at The Little Gym of Greensboro, a skater with Greensboro Roller Derby, and a major fan of unicorns, cats, Disney, and traveling. Danielle Guilbeault is a senior psychology major at UNCG, with a primary concentration in pre-med. She is interested in working with children because she wants to specialize in pediatrics. She hope to learn about the development of cognition across different ages as she thinks it will help her to communicate with future patients and their parents. Danielle works as an EMT and in her free time, she enjoys reading, binge-watching tv on a rainy day, and going to outdoor concerts. Cherish Li received her first Bachelor of Science degree in human development and family studies at UNCG and is currently working towards her second undergraduate degree in the psychology. Her research interests include children's social development, intimate relationships, family transitioning, interracial marriages, and social development across cultural groups. In her spare time Cherish likes to watch TV series like Bones, NCIS, as well as food channels. Megan Saunders is a senior double major in psychology and Spanish at UNCG. Her goals after college are to go to graduate school for biostatistics and eventually do research on how substances affect the brain. Outside of class, she enjoys volunteering with her sorority, Chi Omega, and cooking new recipes for friends and family.